You will often see carpet browning or carpet yellowing occur shortly after hiring a carpet cleaning Fort Wayne service that uses too much water for their service. To avoid carpet browning, be careful hiring steam cleaners in Fort Wayne. The reason for carpet browning is related to wicking. This occurs when a carpet gets far too wet or saturated during the cleaning process. The excess moisture permeates deep into the carpet until it reaches the pad. Then the pad and deep fibers push all the water up to the surface through evaporation and the brown or yellow spots start to appear. This is why several homeowners in Fort Wayne claim that professional carpet cleaning actually makes their carpet dirtier than it was. If you are constantly experiencing carpet browning after hiring steam cleaning companies in Fort Wayne, it is time to consider a new type of service. You will also see browning more often in natural fibers. If you own a wool carpet or jute carpet, you should invest in a high-quality cleaning service to ensure the best results and reduce the chance of browning occurring. These natural fibers create a browning that is impossible to remove with store-bought carpet cleaning chemicals or DIY stain removal techniques. There is a lot of evidence to prove that you don’t want your carpet to be too wet. You will see both carpet shrinking and carpet bubbling from wet carpet and now you are familiar with carpet browning as well. You simply do not want to expose your carpet to more moisture than is absolutely necessary. This means you should hire a low-moisture carpet cleaning company in Fort Wayne. Chem-Dry of Fort Wayne provides a service that only needs 20% of the water that steam cleaners use. We don’t saturate your carpet. You won’t see browning or bubbling or shrinking after an appointment with Chem-Dry of Fort Wayne. 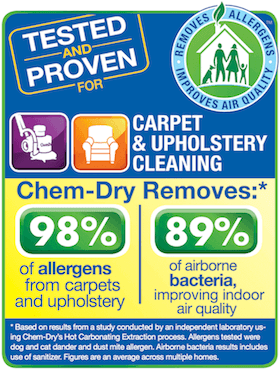 You will only see clean and healthy carpet for you and your family to enjoy! To schedule an appointment, call (260) 409-1138.